The TYVT series has been discontinued. Please contact our FLOW dept. Engineering department. 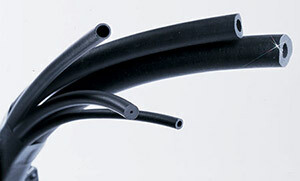 FKM tubing offers superb chemical resistance to a broad range of materials with the flexibility of rubber. Under static operating conditions, FKM has been tested at up to 260°C (500°F) for up to 1,000 hours, and at up to 204°C (400°F) for up to one year. At these high operating temperatures, fluid pressure must be kept at a bare minimum-field testing must be performed to determine the maximum pressure rating of FKM tubing in your application. In addition, it must be noted that pulsating flow or peristaltic pump applications can cause a dramatic decrease in the operating temperature/pressure of the tubing, as well as a dramatic decrease in the tubing’s useable lifespan. Again, field testing is required to determine these parameters in light of the end user’s particular application. *Values listed are typical and are meant only as a guide. Field testing is recommended to find actual values for the given application. Note: The 60A durometer compound is specially formulated for use in peristaltic pumps. Color is black.